For this month’s assignment from Kristina at Speakeasy (don’t forget to check out her challenge) I’ve watched this romantic tale of star crossed lovers on their way back to San Francisco from Hong Kong by way of a luxury liner. A popular backdrop for many a film during Hollywood’s golden era. 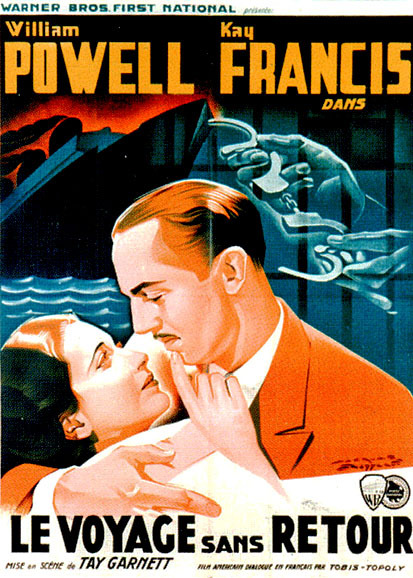 Before actually boarding the ship our leading man William Powell has crossed paths over a drink with attractive Kay Francis. After a friendly toast, Powell moves on only to bump into Warren Hymer who happens to be holding a 45 automatic in one hand and a set of handcuffs in the other. He’s been hunting Powell for a long time and finally has his man. Once aboard ship and bound for home with the death penalty awaiting, Hymer agrees to allow Powell the freedom of the ship. Using his limited time and freedom Powell goes about tracking the woman he knows only as Joan. Joan of course is played by Kay Francis decked out in gowns by Orry-Kelly throughout the film’s tight 68 minutes. Francis is a young woman who is on her way to a sanitarium and due to her failing health will probably never see it in the first place. Upon finding Powell aboard ship she sees a window of happiness and grabs onto this precious gift that fate has given her. The irony is course that both leads are facing their own mortality and for most of the film are unaware of the others’ predicament. Along for the ride and supplying the comedy bits in the film we get Aline MacMahon in a fine role as a would be Countess who is actually a con artist trying to help Powell by keeping cop Hymer busy. We also get popular character actor of the day Frank McHugh as another Powell partner doing his best to fleece a few wealthy passengers and stay away from Hymer’s wrath at the same time. The film was directed by Tay Garnett who does a solid job here of mixing location filming with some stock footage as well. I always like seeing a camera movement that isn’t normal for the era and there is a fine one when Powell has fallen overboard and from his POV the camera zooms up to the ship’s rail and focuses on Francis. Nice shot. Garnett would of course have a long career bringing us the classic Postman Always Rings Twice in 1946. Kay Francis is one of those actresses that I am aware of but admittedly haven’t seen many of her films and will have to watch a few more. Classy look and she fits right into the golden era. Powell will always be The Thin Man and connected to both Myrna Loy on screen and sadly Jean Harlow off. Hard not to watch this film and think of two others, Dark Victory and Affair to Remember. The Oscar winning script was actually remade with Merle Oberon and George Brent in 1940 under the title ‘Til We Meet Again with Frank McHugh reprising his role from this film. Give it a shot and keep the tissues handy. 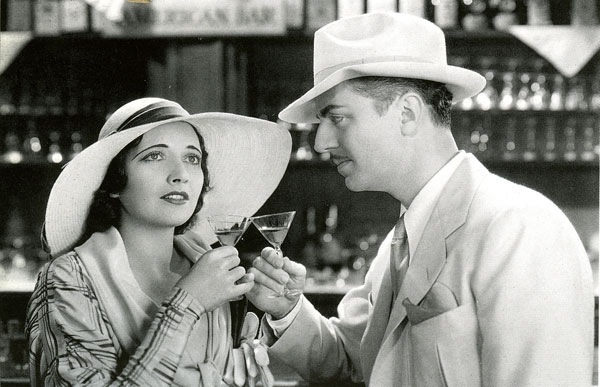 Kay Francis (like Warren William) is someone fun and rewarding to discover, and you want to see a lot more of once you do. I think this is one of the greatest romance movies of the 30s. Powell is really great in this. glad you enjoyed! I can see why you would think it’s a great romance film. Love the symbolism in the fade out as well.